some of the nicer stimmy's i've seen! DANME - lightenup's hair fiber stacking is appropriate. I think your stacking skills can get honed in over time to make each fibers end even with one another. Lightenup - what I really appreciate about your these 2 stimmy's (especially the burgandy? colored one) is that the head of the fly (where you've tied your elk (looks like elk) hair wing & grizz hackle wrap is so narrow and not at all bulky. I have a problem of having too 'steep' of a taper at the top of the fly leading towards the eye of the hook due to the bulk of my elk hair wings. 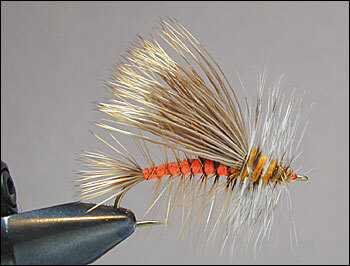 What happens with this is that last wrap of hackle slides out of place - towards the eye. I'm having trouble with the wire and accidentally Attachment 6771Attachment 6770catching the hackle, and believe me, I wiggle the wire back and forth (have fun with that one)......I have to work on the taper, and just keeping it real "tight", any suggestions, if you please. On the wire thing, I've read in Cravins book that wrapping the same number of wraps and angle as your hackle will minimize trapping. I started wrapping my wire in a mirror image of my hackle making perfect X's with each wrap and it has all but eliminated trapping. Like Charlie says, "wrap like the hackle ain't there", no wiggles. In his book Tying Dry Flies, Kauffman lists the TMC 200R as the hook to use. Since I started using this curved shank hook I find my Stimulators look 100 percent better.